Now is a GOOD time to fix South Africa. will be unaffected by what happens in a town or city. so that our towns and cities offer a pathway to a GOOD life for everyone. safe and socially inclusive communities. To bring power as close to our people as possible. declining economic growth, and the crippling corruption that’s brought our country to its knees. development of our future leaders. is not afraid to tackle these issues honestly, and head on. The GOOD party is led by GOOD people, fighting to create a GOOD life for every GOOD South African. We stand for the GOOD of our people. The GOOD of our country and the GOOD of our planet. And we believe that serving you, the people of South Africa, is our privilege and honour. structural and socialised disadvantage that determines who succeeds and who doesn’t. 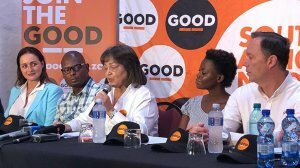 GOOD is continuing to develop its PLAN to fix our country and will expand this offering in the months ahead. Now is a GOOD time to vote for GOOD.